With our 'turn-key' service that includes CIF to your nearest sea port, installation, commission and training, you can be assured there are no budget overruns or hidden costs, and we pride ourselves on completing the project within the timeframe agreed upon. Following start-up, Cuddon has effectively supported their equipment and the contractor relationships. As a Nutritionals business, we continue to look to them for solutions in Freeze Dry applications. They have a long-standing reputation in NZ and are growing their US client history. I’ve seen Cuddon take special efforts to assure positive outcomes for all groups involved in rolling out significant projects for their customers – while retaining accountability across the team. They also strive to maintain a properly trained and experienced staff. The Cuddon model FD5.5 chamber is mounted within an enclosed steel frame with castors for easy manoeuvrability. 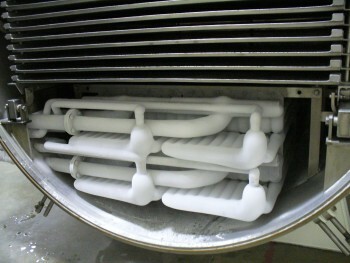 The vacuum pump, refrigeration unit and the pipe work are all mounted within the enclosed frame. The plant is pre-wired and is comprehensively tested in our factory before delivery. The Cuddon model FD300, FD600, FD1000 and FD1500 projects have the chamber, door, hinges, shelf modules, trays and vapour condenser constructed from AISI 304 stainless steel. All plant equipment is mounted on individual skids, custom made to suit the clients factory and are installed on site by our engineering team. Unless otherwise specified, Cuddon Freeze Dry sales include CIF freight to your nearest international seaport, installation/commissioning/staff-training by Cuddon engineers, and a full 12-month warranty. Cuddon Freeze Dry’s quality acceptance test is to sublimate and condense the vapour condenser capacity of ice within 24 hours. For example the FD80 equates to 80kg of ice. The product chamber is designed to allow clean room separation and has modular shelving and the ice condenser located internally. The model FD600, FD1000, & FD1500 freeze dryers have a door at each chamber end, allowing wet and dry room application. The model FD5.5, FD18, FD80, & FD300 has a single door for loading and unloading. There are viewing ports in the doors, allowing observation of both the vapour condenser and product trays during the drying cycle. Temperature sensors and process valving connected to the chamber interface to the control system to maintain and record the process variables. Two sets of grade 304 stainless steel trays are provided as standard with tray trolleys. The Cuddon Freeze Dryers has a purpose built system that uses OMRON control platform. A PLC and OMRON touchscreen control panel are connected on an Ethernet communication protocol. The user screen includes graphic over-view of freeze drying system and the automated system will ramp /reduce energy to govern sublimation pressure to pre-set parameters. The system is password protected. The system has a 15 x 12-step recipe programming capacity, 250 batch storage, and software for data retrieval and analysis. Batch reports for every drying run are filed and access via LAN and internet allow authorized entry to view and control the Freeze Dryer. Smooth flat plates fabricated from grade 304 stainless steel allow an even internal distribution of the heating or cooling medium. Shelf spacing can be factory set during manufacture to suit individual loading. Shelving in the FD80 to FD1500 models have removable modules for easy clean and inspection. Defrosting ice after a product cycle is by water. The product is removed and the door (s) closed. Hot water is recommended for fast defrost with the option of using heat recovery from the refrigeration system for the FD300 to FD1500 dryers. 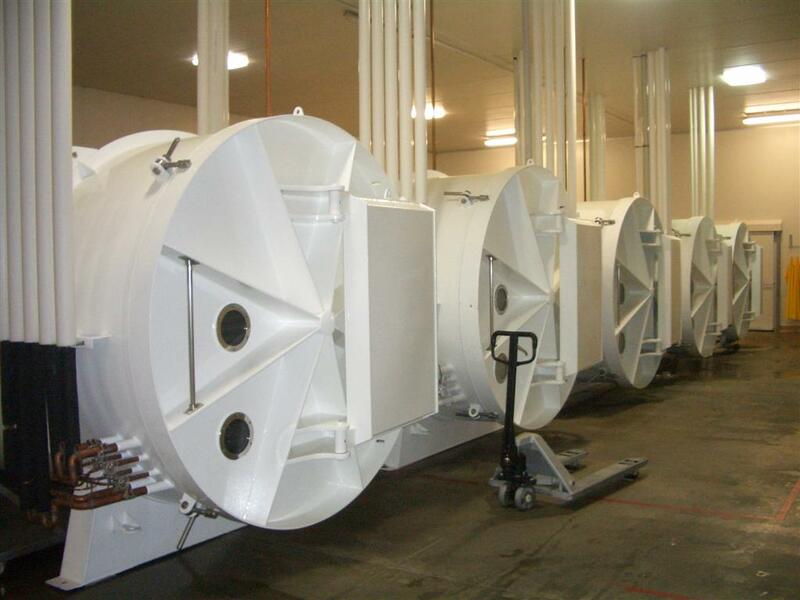 Cuddon Freeze Dryers have a purpose built refrigeration unit which maintains the stainless steel vapor condenser temperature when in Dry mode. The system also can control the shelf temperature by heat exchange to a secondary fluid. Where practical the refrigeration condensing unit includes capacity control to allow economical use of the low-temperature R507 refrigerant. The standard package uses a water cooled condenser but where cool process water is not practical we option a remote mounted air- cooled condenser for heat rejection. The Cuddon model FD5.5, FD18 and FD80 have a two stage rotary vacuum pump and are connected to the chamber by loop piping and pneumatic isolating valving. 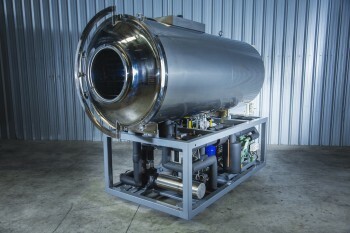 For larger dryers including FD300 to FD1500 models a combination of roots blower and single stage rotary vane backing pump are connected to the chamber by stainless steel lines and pneumatic controlled isolating valve. The vacuum pump exhaust is vented to the exterior of the building. Variable capacity electric heating system is connected in series with the modular shelving. The heat transfer fluid is circulated by a multistage centrifugal pump which allows heated or cooled fluid to be circulated through the plates on demand from the on board control system to enable a controlled sublimation rate. All controls, piping and accessories are included and installed as part of the project. 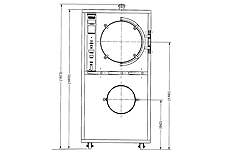 Our standard general purpose dryer offers variety and capacity with single stage refrigeration system. 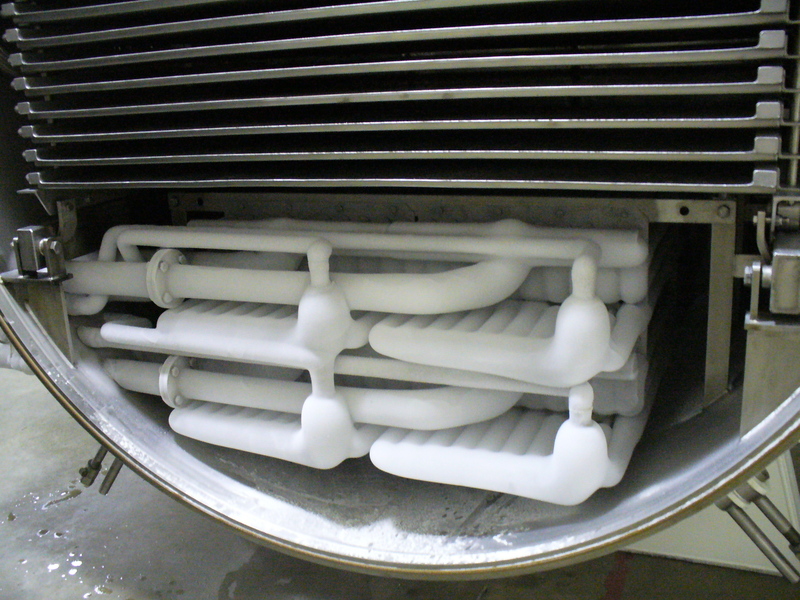 When complex products that remain unstable at conventional drying temperatures are identified as a target product a lower temperature option can be quoted, giving –55°C vapour condenser temperature, and –35°C/+60°C shelf freezing/heating.